Are you looking for all the recipes from my Today Show appearance and can’t get your hands on them? Well, I’ve got you covered. Below you’ll find all of the recipes in one place. You can print them out or save them to your Recipe Box. Preheat the oven to 375°. Sprinkle the cheese and bacon (or ham) in the bottom of the pie crust. In a medium bowl whisk together the eggs, cream, salt and pepper. Pour the egg mixture into the crust. 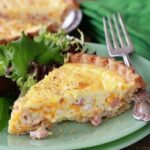 Place the pie on a rimmed baking sheet and bake for 20 to 25 minutes or until the quiche is just set. Serve warm. In a large skillet over medium heat, cook the bacon until crisp. Drain the bacon on paper towels; crumble it when it has cooled. Add the chopped onions to the bacon grease in the skillet, and cook over medium heat for 4 to 5 minutes. Add the garlic, and cook until it is fragrant. Sprinkle the shrimp with the salt and pepper, and then add them to the skillet. Cook the shrimp until they are just starting to turn pink, about 3 to 4 minutes. In a small bowl whisk the flour into the broth. Pour the broth over the shrimp, bring just to a sim­mer, and cook until the sauce thickens. Stir in the lemon juice, and serve immediately over My Secret Cheese Grits. In a medium saucepan with a lid, bring the water to a boil and stir in the salt. Slowly add the grits, stir­ring constantly to prevent lumps. Reduce the heat to low, cover, and simmer, stirring occasionally, for 15 to 20 minutes or until they reach the desired tenderness and consistency. Grits should be smooth and creamy, not chewy. Add more water if they begin to dry out. Just before serving, stir in the cream cheese, cheddar cheese, and butter. Stir until melted and combined. Serve immediately. Saw you on TODAY show Sunday. So great to see a fellow River Region 🙂 Resident (Wetumpka) on TV. I knew you were the real deal when you cooked quick grits twice as long as the package says. 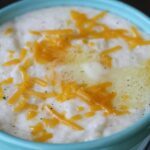 I added cream cheese to my cheese grits this week and the were delicious. So glad to have found your blog. Ha! Thanks, Jane! I’m glad you found me, too! Thanks for watching! Have you tried white stone ground grits? I’m sure you have; but I rarely use store bought grits since I have found stone ground. We use Oakview Farms when we can and that should be close by to you:) I love reading your blog and all the “regular” down home cooking recipes! HI Miriam! Oh yes, I’m quite familiar with Oakview’s grits – in fact, I think I have some in the pantry now. I love them, but I also love the convenience of the quick cooking variety on a busy weekday morning. I know I’m a little late to the game, but I just discovered your blog and I love it! 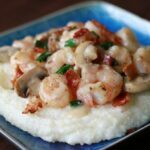 I have been looking for a good Shrimp and Grits recipe and I hope to try yours, but I notice in the picture there are mushrooms, but you don’t list them in the recipe? Would it compromise the recipe if I add them? I like mushrooms and think they might add a nice touch to the recipe. Any guidence? Yes, you can certainly add the mushrooms with the green onions! 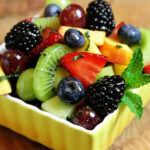 I just discovered your blog and I am tickled pink by all the lovely Southern recipes. I remember my Mawmaw making a lot of the things that I have found here and those lovely memories are so precious. Living in NW Georgia, we purchase stone ground grits from Nora Mills right outside of Helen. Since finding them, I haven’t bought a single package of “quick” grits and probably never will again. Thank you for all the yummy recipes! God Bless! Thanks so much, Jennifer! So glad you’ve found so much you like! Tracy, were you on Food Network ?? If so, loved you than, if not love your recipes !!!!! I’m not seeing the recipe for the quick quiche – is it my computer or is it the page? Try now. It should be showing up correctly.